Dreams in the Lich House: I love "The Darkest Dungeon"
I love "The Darkest Dungeon"
My 14 year old picked up this game on Steam a couple of weeks ago, "The Darkest Dungeon". I watched him play a few minutes and didn't think it was great - it has this low tech 2-D graphics and combat techniques out of something like 4E or an MMO, full of buffs and de-buffs. But then I watched the trailer to the game… "Ruin has come to our family. You remember our venerable house, opulent and imperial, gazing proudly from its stoic perch above the moor…" It's a theme straight out of HP Lovecraft, about a decadent ancestor that dabbles in forbidden lore and awakens an eldritch horror deep beneath the ruined mansion. 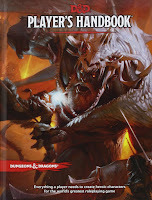 In the game, you take your squad of four stalwart warriors through dungeons filled with cultists, fish-men, undead, and horrible Lovecraftian bosses like the Inchoate Flesh, the Collector, and the Shambler (which looks a lot like a Shoggoth). The art is reminiscent of Mignola's work with Dark Horse comics, full of stark shadows. What drives the Lovecraft theme home are the stress and afflictions suffered by your party. The party takes on stress damage in many ways - any time the dungeon gets too dark (and you let the torches go dim), any time you run out of food or the right equipment, whenever a monster scores a critical, and many monsters do psychic damage to the characters. Stressed out characters develop afflictions, like paranoia or abusiveness or fearfulness, and stop responding to your inputs - they may not let the party healer fix them, or pass their turn when you need them to attack. Characters also develop quirks (both positive and negative), like addictions to material things, or a thirst for strong drink. Whenever you return to town, it's common to check most of the survivors into various institutions in the hamlet for stress relief - the tavern, gambling hall, brothel, prayer or meditation, for instance. There are doctors to cure diseases and a sanitarium to remove quirks. There's always new adventurers arriving on the stagecoach, because it's common to need new guys (or abandon mentally unstable characters that pick up too many bad quirks). You end up managing a troupe of 20+ characters - it's awesome. 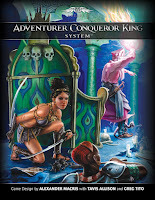 Of course, the game-play itself is really about resource management - maintaining the health and sanity of your party, making sure they have the right skills for combat and camping, managing your money, buying the right gear for the dungeon delves. Actually, gear is very important, as there are lots of things in the dungeon that react positively if you use the right equipment on it - like getting a benefit from the unholy fountain if a character pours holy water on it. You're constantly outfitting parties and planning a wide range of delves. 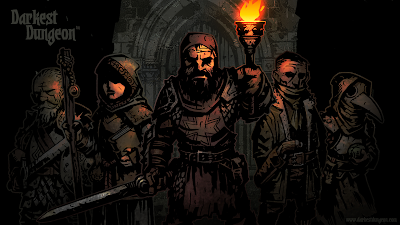 Naturally, the mind wanders to consider how the game play in The Darkest Dungeon could be adapted to the table top. I like the stress mechanic, since it gives the referee a nice in-game reason to drain money in-between game sessions when players spend time at the tavern or chapel, or getting their various grotty diseases cured. Quirks and afflictions are a little harder in the OSR space, as blogger theorists get really upset at any mechanic that threatens player agency. For instance, you may come across some nasty barrel of rot gut in the dungeon, and that one guy who is addicted to alcohol will run forward and take a drink before you can do anything during the game, picking up a disease. That type of mechanic doesn't port as well to the table top, but there might be a way - D&D is full of charm monsters, for instance. Anyway, I've been in India a couple of weeks, away from the states and away from the gaming computer. 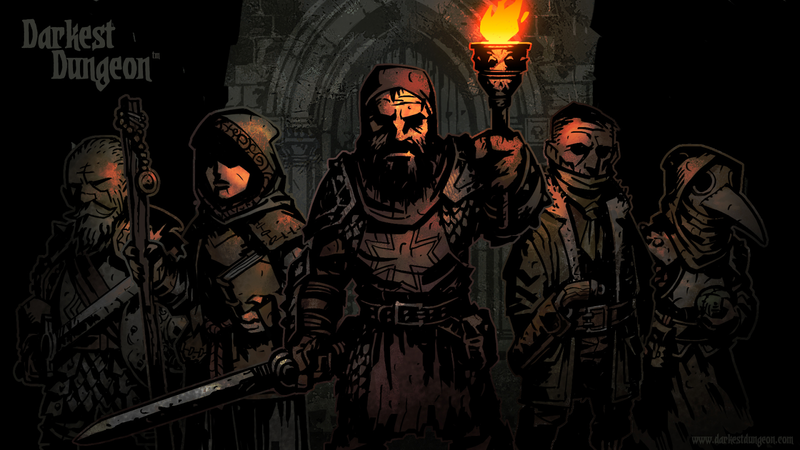 Writing about The Darkest Dungeon is going to help me with my own withdrawal symptoms. It's worth checking out if you'd enjoy what's essentially a squad-based tactical game with a theme and monsters heavily influenced by the Cthulhu Mythos. 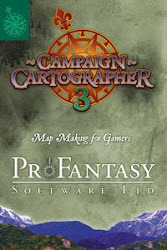 It'd make a fantastic setting for LOTFP.